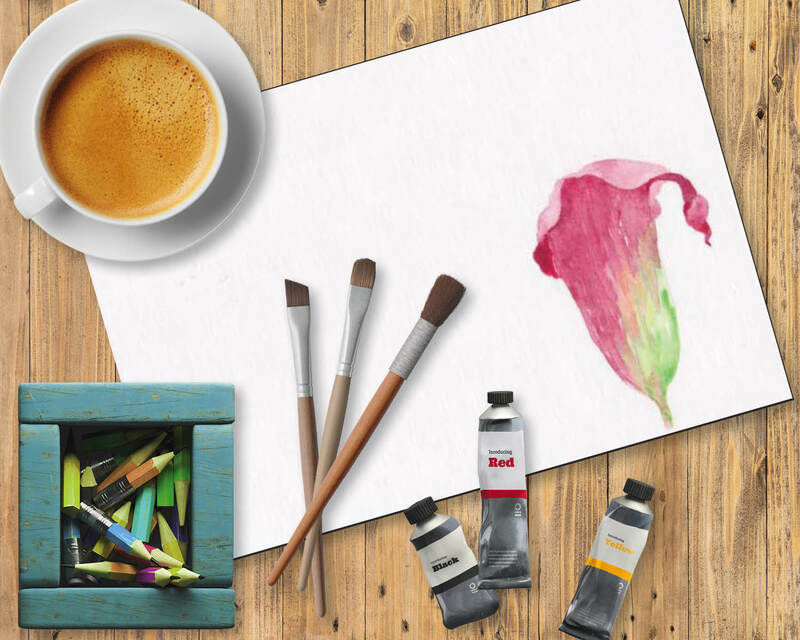 Have you ever wondered how digital artists turn a watercolor painting into clip art? 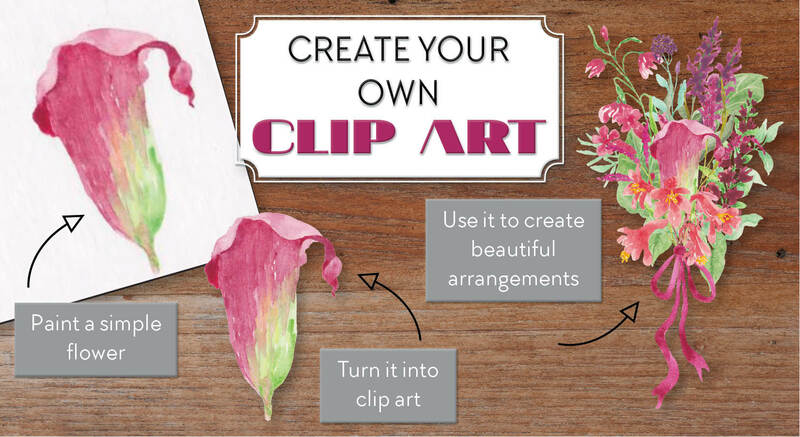 As you know, clip art has a transparent background, so that you can paste it into any design. A “normal” image in JPEG format has a white background. If you incorporate a JPEG image into a design that you’re working on, you’re going to have all that white background blotting out the rest of your design. Clip art, with its transparent background, is usually in PNG format. This tutorial is for “entry level” crafters and will describe a process that experienced designers are familiar with. There are many ways to create clip art; what I’m describing is my version, but it wasn’t developed by me of course! A simple watercolor painting. I’ve used a pink calla lily. A scanner (ensure that the glass surface of the scanner is clean). Access to image editing software, such as Adobe Photoshop, or the free alternative, Gimp. 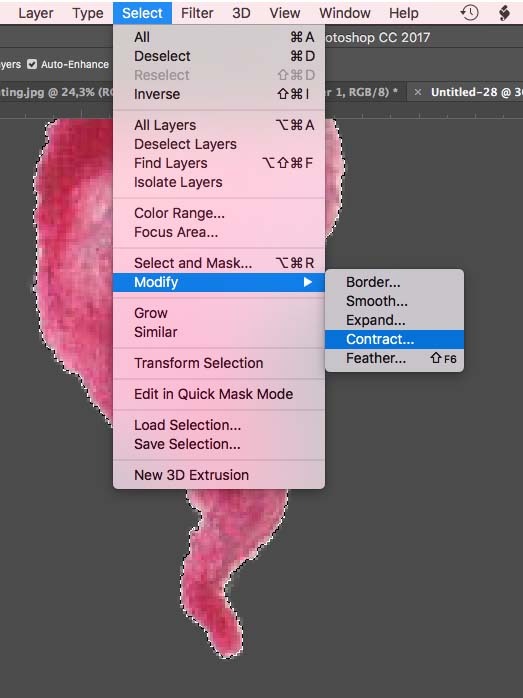 The description in this tutorial is based on Photoshop. Furthermore, I assume a basic understanding of Photoshop, such as working with Layers, Tools etc. Firstly, paint something simple using watercolors, on to watercolor paper. Here’s my example. You can use acrylics if you like – the process of creating clip art with that medium will be the same. 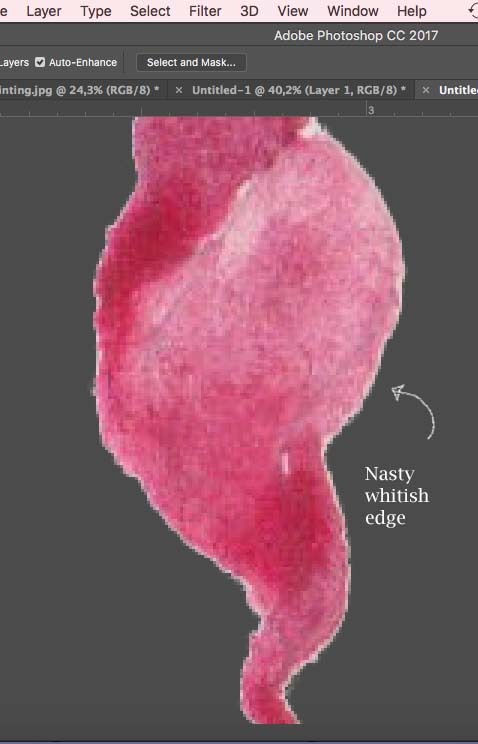 When your watercolor image is dry, scan it at 300 DPI (DPI stands for “dots per inch”; this term is used loosely instead of the more accurate term PPI – “pixels per inch”). The DPI measure reflects the resolution level of the image. Enough with the technical stuff! 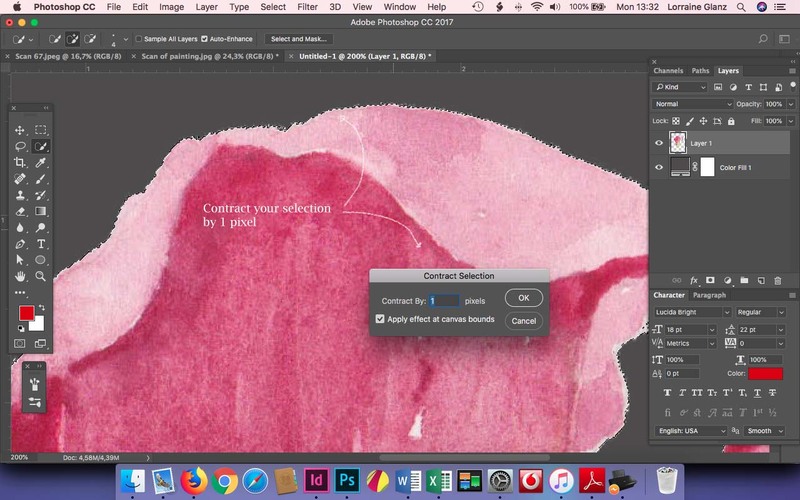 Open your scanned artwork in Photoshop. 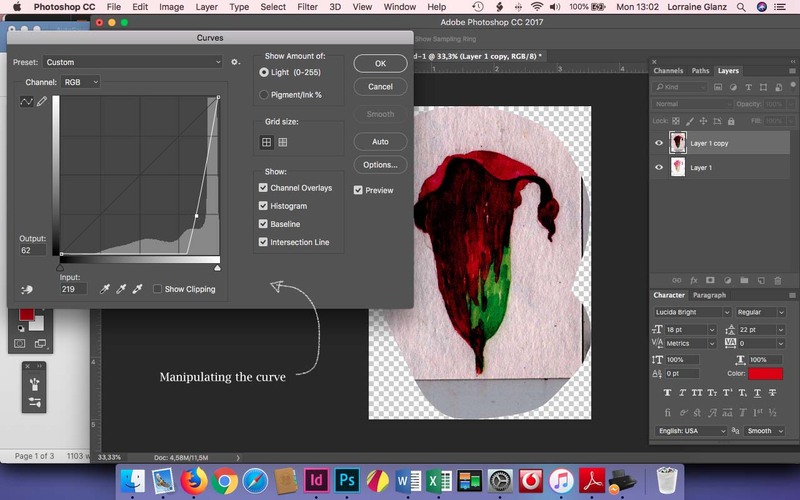 Using the Lasso Tool, make a rough selection of the artwork (see video clip). Copy your selection (select “copy” from the “edit” menu); open a new document (“file” -> “new”). Photoshop will automatically create a document of the correct size for your copied image. Ensure that the new document has a transparent background. Paste your selection into the new document (“edit” -> “paste”). 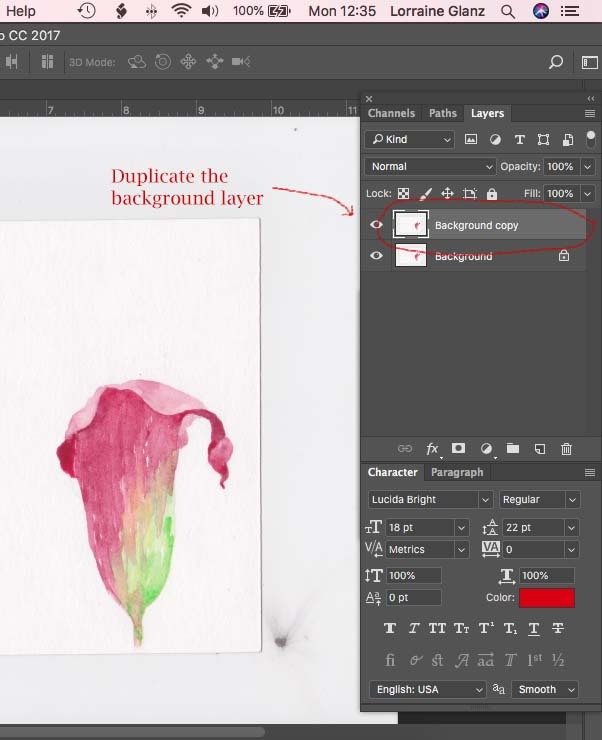 Working in the new document (from this point forward), in the layers panel, create a duplicate layer of Layer 1 (your background layer). With the duplicate selected (Layer 1 copy), go to “image” -> “adjustments” and open the “curves” option. In the “curves” panel, manipulate the RGB channel by dragging the diagonal line down in order to make the artwork very dark (see screen shot). This makes it easier to make a good, accurate selection of the artwork. Working in Layer 1 copy, enlarge your image about 4 or 5 times. Use the Quick Selection Tool, set at 4 pixels, to select the complete piece of artwork. Move your mouse around the entire enlarged image to ensure that you’ve selected everything. Return your scan to the normal screen size so that you can get an overall view of your selection. The selection has the typical “marching ants” look (see video clip). When you’re happy with your selection, delete the duplicate layer (drag it down to the trash icon of your layers panel). The color of the artwork will return to normal but the selection will remain. Inverse your selection (“select” -> “inverse”) and delete (“edit” -> “cut”). This deletes the watercolor paper background (see video clip). Once you’ve deleted the background, re-select your artwork (“select” -> “reselect”). Be careful here – this re-selection must still be inverted (“select -> “inverse”). Now you have a selection of the artwork. Edge detection: Radius set at 0,0 pixels. Feather set at 0,0 pixels. Shift edge set at 0%. A new document will open containing your artwork that has undergone the first step in the edge-refining process. Add a dark background behind your clip art, so that you can see what still needs to be “cleaned up” further. To create that dark layer, go to “layer” -> “new fill layer” -> “solid color”. Choose a nice dark grey. Press OK. 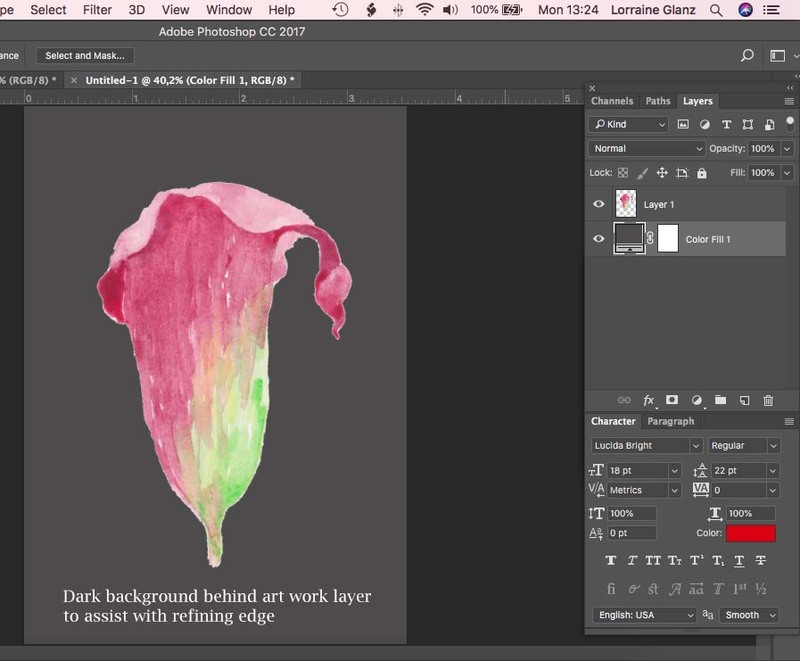 In the layers panel, ensure that the dark background layer is behind your artwork layer. In your artwork layer (very important), go to “select”, choose “load selection” from the dropdown menu, then choose “layer 1 transparency”. This selects your artwork again. You’re going to contract the entire selection by 1 pixel, to get rid of the rough edges or the whitish edge. Go to “select” -> “modify” -> “contract”. Choose a 1-pixel contraction. Press OK.
Now the important thing is to inverse this selection, so that you can delete the rough bits and/or whitish edge. Go to “select” -> “inverse” and then delete (“edit” -> “cut”). Refer the video clip. The last step in the refinement process involves moving around the entire edge of your artwork with your mouse and deleting any bits of background watercolor paper that may have escaped the previous steps. Use the Eraser tool to do this. Set the tool at 4 pixels (see video clip). Once you have moved around your entire artwork and cleaned up the edge in this way, you have a piece of clip art of high quality. Delete the dark background layer. 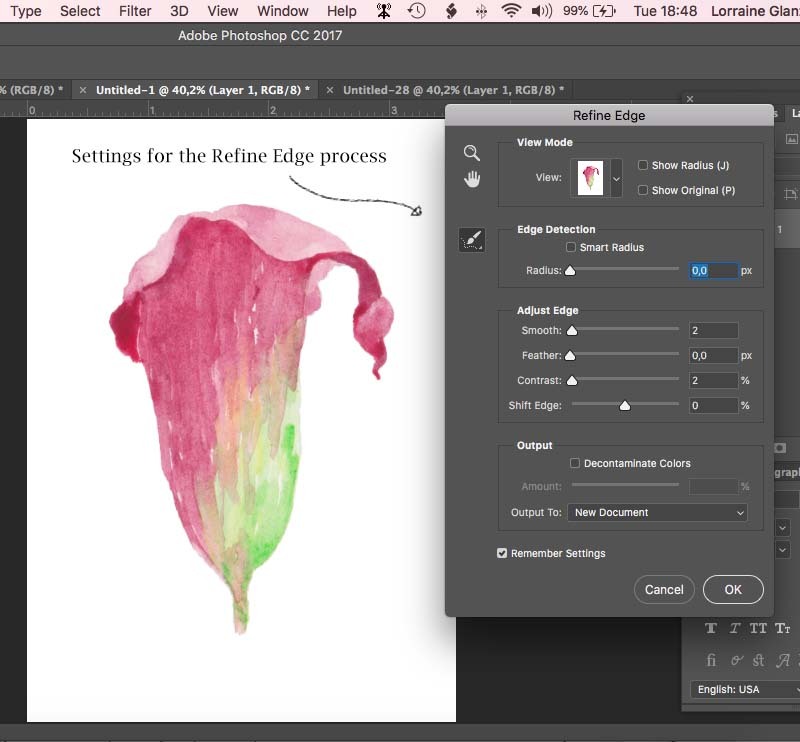 Use the Crop tool to crop your artwork (see video clip). Save your artwork as a PNG file. The clip art is ready to become part of a beautiful arrangement of flowers, which in itself will become a piece of clip art! Here’s an example of how I’ve used the calla lily used in this tutorial. 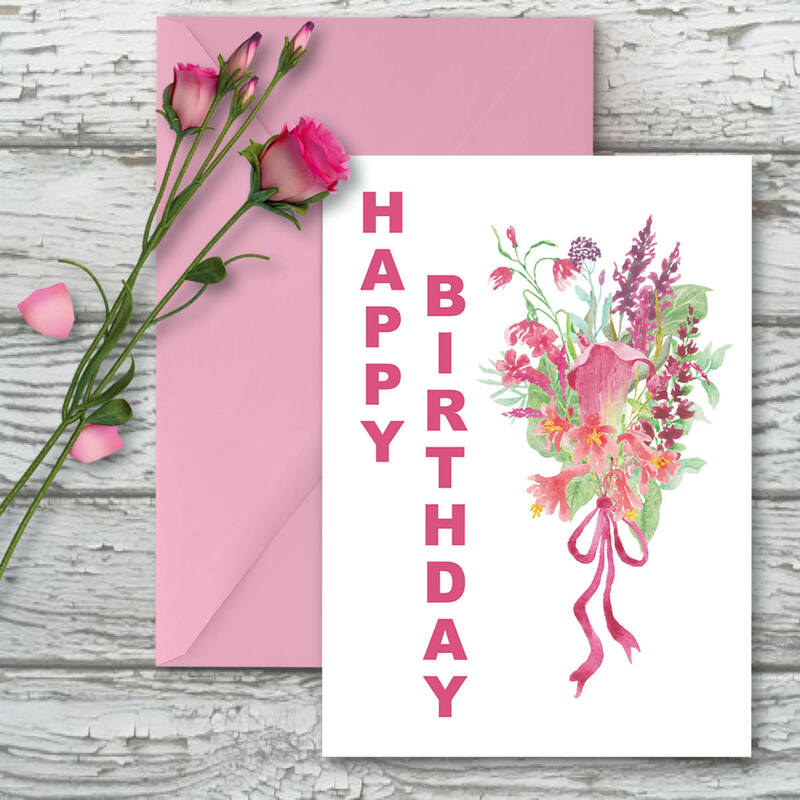 You can download this card and the clip art bouquet HERE. So, as you can see, creating clip art of a high quality is a time-consuming process. I hope you’ve enjoyed this tutorial and have found it useful.